The Wood Runners are chatting; some drinking tea, some coffee and all eating well earned cake. Two blokes are looking through a new shiny black folder. STU: Those two are a bit close together. So to the day of the Castleton Fell Race. It’s 5pm, I’m driving home from work through the Peak District. I’d be better off in a boat. A months worth of rain is lashing down and I’ve just had to ford a newly formed river to get off Sheephill Road. In two hours time I’m supposed to be running up Lose Hill and Mam Tor in my 5th ever fell race. My 6th is supposed to follow 36 hours later. Being new to all this, I am wondering how much water cancels a fell race. Arriving in Castleton the torrent has abated. The car park turning has a kindly marshal stood in it with a big sign informing me that the car parks a quagmire and I’m to park in the village. Car parked at the other side of the village, racing Roclites on feet and kit on my back I head down to register chatting to another runner, Mark, about the race to come, races we’ve done before and how we’re both definitely taking full kit round with us as we’d be daft not to. And we’re off, forcing myself not to get dragged along I settle into my usual pace of just behind mid-field where I’m joined by fellow wood runner, Sam. We make headway up the tarmac and before we know it we’ve hit the dreaded bottleneck. A gated rocky gully that drops everyone to a walk because someone further forward deemed it un-runnable. At this point Sam leaps up the bank and disappears like a scolded rabbit. I think about following him for about half a second and then think better of it and stick with the shuffle to the gate. Out of the gulley and the climb really kicks in. I gain places as I hike up the soft grassy path, Mark passes me and I notice he’s as daft as I am and also ditched his kit. The climb levels off and starts to descend slightly. I pick up the pace through a slippery wooded section that ends rather abruptly at a fence and stile. Out of the woods, now level with a wispy cloud bank, Hope Valley stretches out below as I watch my pace through a few fields and over a couple more stiles. Then a left turn onto the climb to the top of Lose Hill and I’m walking again on the wet flagstone steps. At the summit I’m momentarily distracted from my now aching legs by the view across to Derwent Reservoir. The distraction doesn’t last long as I’m onto the first proper descent of the route and having to make decisions about whether to continue on the flagstone path or keep off to the side on the grass. I use both and soon the route starts heading briefly back up again to Back Tor. The descent off Back Tor looks worse than I’d been told. Steep, rocky and freshly softened by the rainfall. Most people seem to be sticking to the right hand side down the rocks whilst I cleverly pick a route down the left grassy bank with the sheer drop next to it. The potentially more lethal route works in my favour as I’m rapidly at the bottom and in front of two more people. I try and keep an even pace towards Hollins Cross but struggle slightly on the wet grit, wet rock and wet puddles. 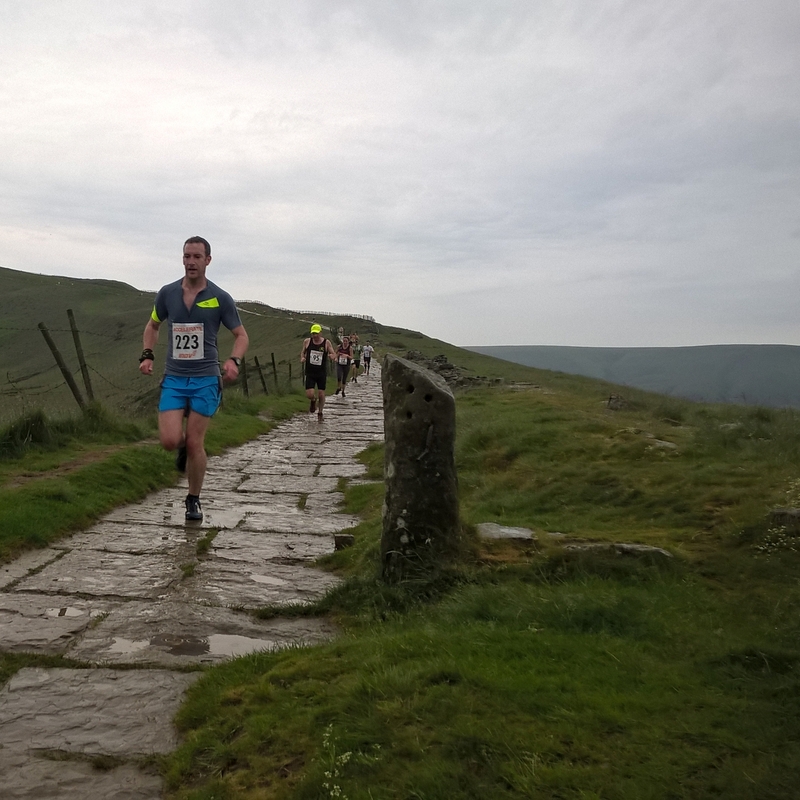 The flagstones reappear as the final climb up Mam Tor looms into view, this section also introduces Castleton’s other key feature; avoiding the descending quicker runners. For someone who nearly always goes the same way as someone coming towards him, this had me worried. Thankfully most seem to be taking a wide line out left for the descent to avoid the flagstones where possible, a route I make a note of for the return from the summit. Halfway up the climb I slow to a walk and surprisingly see Sam just up ahead. He’s not having a good time of it. We chat and then get each other back into a jog as we round the summit of Mam Tor. Now the fun starts. My heart rate drops to a nice level and I aim myself for the grass line I’d seen the faster runners hurtling down on my way up. A couple of gates break up the feeling of speed and before I know it I’m back on the flagstones again. I trust my shoes will grip and keep the pace up, a sharp right turn through a gate at Hollins Cross and I’m onto a dirt and stone descent that looks like the hillside has just decided to slip away from the rain. I pick a line to the right this time, again close to another sheer drop. My foot slips and for a second I think I’m going to be heading down it. I decide at this point that maybe the middle of the gully looks better and get off the edge. Past three more runners and a marshal is kindly holding a gate open. It takes me until halfway down it to realise I’m back in the bottleneck gulley which seems to be less fun to run down than it was to shuffle up. Then it’s the worse section of any fell race; back to the tarmac. I’m going as quick as I can but one of the runners I flew past on the hill descent comes back past me. I’m not going with him and after a quick look behind to see if anyone else is going to mug me I put all my effort into keeping my pace as the tarmac flattens off. The last turn into the field looms into view and I try to dig in across it but stumble and slow across the finish. 61 minutes, just outside my sub-hour aim and I’m feeling pretty wrecked. 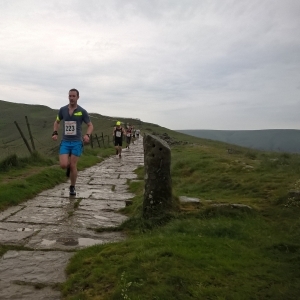 Edale is going to be very tough.